This great jersey is exact replica of famous jersey from 60s and is made from 100% wool with chainstitch emroidery. 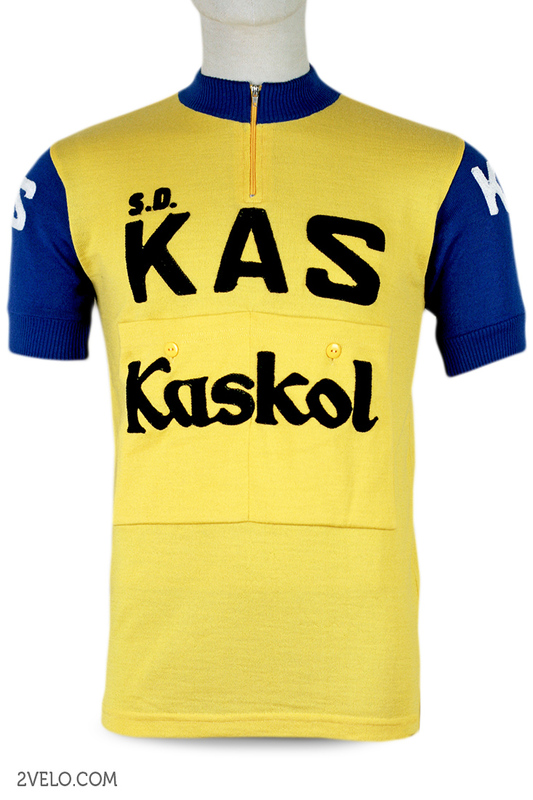 Kas was a Spanish-based professional cycling team which was active from 1958 until 1979 and again for three years in the 1980s. The team was principally based in Vitoria-Gasteiz, Spain. Its riders typically wore a jersey that consisted of yellow and blue. The Kas team began operating in 1958, and in that year one of its riders, Fausto Izan, won a stage in the Vuelta a España. In 1959 the team signed the 1958 Spanish champion, Federico Bahamontes, who at that time had won two King of the Mountains classifications in both the Tour de France and the Vuelta a España. The Tour de France was disputed by national teams and Bahamontes won the Tour in 1959. Bahamontes left in 1960 but the team won the King of the Mountains in the 1960, 1961 and 1962 Vuelta a España with Antonio Karmay Mestre. Julio Jiménez again won the King of the Mountains in the 1964 and 1965 Vuelta a España. Kas-Kaskol dominated the 1966 Vuelta with Francisco Gabica winning, Eusebio Velez Mendizabal second and Carlos Echeverría third. It also dominated the King of the Mountains competition with Gregorio San Miguel winning. The team won six stages and held the yellow jersey for 14 of the 18 stages. Kas won the team prize in the 1967 and 1968 Vuelta. In 1971 the team signed the best new professional of the 1970 Vuelta, José Manuel Fuente. Fuente won the mountains classification in the 1971 Giro d’Italia and then won the Vuelta in 1972. A Kas teammate, Miguel Maria Lasa, was second and four other Kas riders placed in the top ten. The team won the mountains, points, and combination classifications and the team prize. It wore the yellow jersey for 17 of the 18 stages.